That night, she woke with a lurch, her eyes flying open and her hand reaching out to the side of her straw pallet. Her fingers grasped the space between the pallets and she lay still, listening to the night and the wind blowing across the mountain behind the croft. “No. Go to sleep.” He rolled over, pulling the blanket higher around his shoulders. “Going into Lochaber has given you strange ideas, Cory. Maybe I shouldn’t take you with me anymore.” He listened for a moment and, when she did not reply, he was about to sink back to sleep. “I dreamed that you let them take me. You walked away! I cried for you. But you were not listening. You did not hear me,” she whispered, a profound terror in her hushed tone. 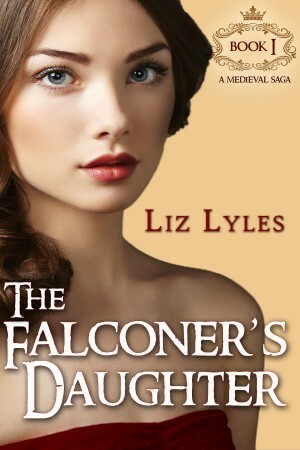 She shivered and inched closer to the falconer. He pulled her pallet next to his and patted the straw. “Hush, child, you will make yourself ill dreaming such things.” She snuggled against him, her eyes just able to make out his profile in the dark. He resigned himself to her questions. “Yes, Cory?” They were inevitable. When hadn’t she asked him things he couldn’t answer? He flashed back to the scene in Lochaber today, the merchant picking up a rock and brandishing it over his head. Kirk had been glad Cordaella was busy in the street with Culross, too entranced by the town activity to see the merchant’s threat. Awkwardly he patted her head, his fingers tangling in her hair. “Everybody is afraid at some time,” he said slowly, quietly, feeling as if he had already failed her. In minutes, she was asleep, but Kirk lay awake, her questions raising questions of his own. Should he send her from him? Should he return her to Aberdeen, the Macleod in blood even if not in name? But for the love of God, she was seven. Just seven. How could he let her go yet? They were still so young together, he the father, she the daughter. He needed another winter, another summer, another lifetime to teach her about the great birds, the subtle but distinct personalities between the hawk and the gerfalcon, the tercel and the peregrine. He wanted to teach her the name of every plant, to help her see the differences among the wildflowers and the herbs and mushrooms which grew wild in the Glen Nevis woods. Cordaella. He wanted to touch her, to brush her soft cheek, but was afraid of the emotion bottled within him. He loved this girl more than life. Cordaella, he thought, watching her, dream. The snow piled outside the cottage door, the night still, no wind to scatter the thick white powder that coated the roof and windowsill. Kirk sat up late by the fire, his black hair shaggy, bangs falling in his eyes. He was determined to finish the doll by Christmas but there were only a few days left. Culross stirred, sat up and got to his feet. He whined softly, his muzzle rising. The wolf growled low in his throat, his lips pulling away from his bared teeth. Outside a heavy hand banged on the door. Kirk set aside the wooden doll, alarmed by the intrusion. There hadn’t been a visitor in nearly two years. He went to the door and unlatched it. For a moment there was just the crackle of the fire and the slow drip of melting snow from McInnes’ cloak. “Hush, the child is waking,” Kirk whispered, going to Cordaella’s pallet where Culross had positioned himself. Reaching over the wolf, he touched her head. He was grateful that she hadn’t woken earlier. “I’m here,” he answered, even as Culross crept closer to her curled body, licking her hand and between her small fingers. “Is someone here?” she murmured. Did you know that The Falconer’s Daughter – Book 1 and many titles are available digitally from Tule's own bookstore? Check it out!